An employment contract is an agreement by which one party commits to compensate another party for the performance of employment services, and the second commits to perform those services, and to be bound by certain specified restrictions. A dentist employment agreement not only affects a dentist's current employment, but it may have lasting effects beyond the term of employment. 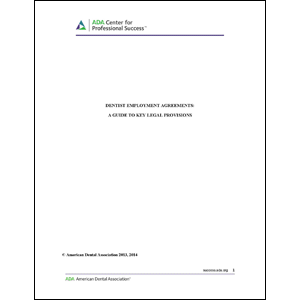 This guide discusses the key aspects of a dental employment agreement.